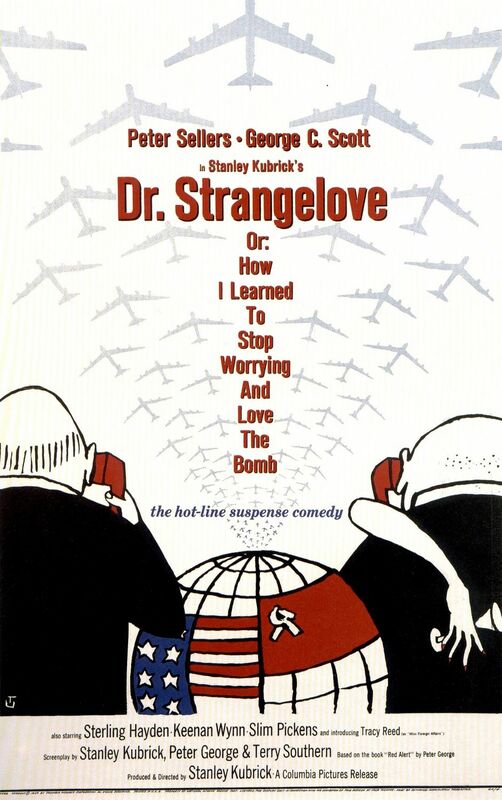 Movie: "Dr. Strangelove or: How I Learned to Stop Worrying and Love the Bomb"
During the Cold War, a rogue US General sends a fleet of bombers carrying nuclear payloads to attack targets in Russia. However, the Russians have just completed their not yet announced doomsday machine in which any attack on Russia would result in immediate and automatic global nuclear fallout. Now, the president of the United States (Peter Sellers) must gather all of his advisers and try to find a way to stop the attack and prevent the impending global tragedy. Can you think of a better movie than "Dr. Strangelove or: How I Learned to Stop Worrying and Love the Bomb"? Nominated for four Academy Awards, including Best Picture, Stanley Kubrick's brilliant dark satire about the nuclear arms race of the Cold War is still just as good as it was when we first watched it many years ago. It was released in 1964, an era when many people lived under the constant threat of thermonuclear war. Well, that's what many in the government and media wanted people to believe. Despite the topical nature of "Dr. Strangelove" to its era, it still remains amazingly relevant and its humor has stood the test of time. Over 50 years later, we still find ourselves laughing out loud at the witty nature of this film. Peter Sellers pulls triple duty here as Capt. Lionel Mandrake, a British officer stationed in the United States under an officer exchange program, President Merkin Muffley the president of the United States, and the eccentric Dr. Strangelove, a former German scientist who served under Hitler, but has since become a U.S. citizen and is now the head of weapons research and development. Sellers earned a well deserved Oscar nomination for his performances in this film. He is brilliant, funny, and much of what he does was improvised, which makes his performance all the more impressive. Sellers might make this movie, but he isn't the only actor who shines as there are many other great performances. George C. Scott, who plays General 'Buck' Turgidson, the president's main military advisor, manages to play both commanding and hysterical; Sterling Hayden, who plays the paranoid General Jack D. Ripper (and while typing out his name, BigJ just now got the 50+ year old joke), the man who went rogue and is responsible for the entire crisis, and Slim Pickens as Major 'King' Kong, the pilot of one of the bombers carrying its nuclear cargo, who has one of the most iconic scenes in film history. Altogether, these actors make up a fine, uproarious cast. We absolutely love everything about "Dr. Strangelove," from its brilliant directing by Stanley Kubrick, to its splendid improvising by Peter Sellers, to its simple yet complex and hilarious story. The dialogue is excellent, the camera work is top notch and beautiful, and the performances are both explosive and zany. We love popping in this film from time to time so we can laugh at this absurd yet extraordinary and timeless piece of cinematic history. One year ago, we were watching: "Moonstruck"